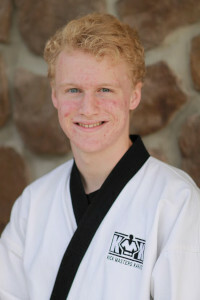 Traditional Martial Arts Classes for Teens and Adults (Ages 12+): The Teen/Adult Classes are usually the last classes of the evening and are the most intense. Occurring 3-4 times per week, teenagers and adults are taught the intricacies of the martial arts in a more analytical and methodical fashion, while participating in challenging workouts, designed to build the body and the mind together. Ages range from 12 and up, and combine cardiovascular endurance with strength and flexibility training. Classes are designed to give an older student the confidence, knowledge, and the ability to defend against an attack. Also, each class focuses on building a better you with our "quote of the week" and our "weight loss tip." This is a great class for older students to shape their bodies into sound, confident instruments, while learning the basics to Tae Kwon Do and its principles. Enrollment is currently being accepted, as new students can begin at anytime. All and all, the Teen/Adult Class has something for everyone, including you!